In the weeks following the devastating Hurricane Maria, Puerto Rico is struggling to get back on its feet. 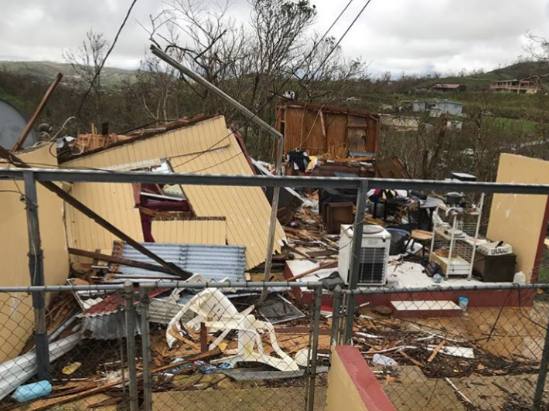 Sadly, Hurricane Maria is not the only natural disaster that has swept the Atlantic this year, as the hurricane season unleashed Hurricanes Harvey and Irma in the weeks preceding Maria. The series of hurricanes wreaked havoc on the island, and the aftermath has left most of the population without electricity or clean water. Though the federal government has sent help, it is hard to tell how long it will take Puerto Rico to regain its strength. “His first floor is completely underwater and all of his refrigerated food has gone bad. He had to walk very far to get anything at all–especially food and water. Even when he did get those, the supply was very limited,” says Juliannie Ortega (278) about her grandfather living in a small town in Puerto Rico. So far 48 people have died in the wake of the hurricane, and many Americans are concerned for family members living there due to the lack of communication. “We couldn’t call anyone for a while. To reach our grandfather, it took two weeks after the hurricane hit, so we had no idea if he was even alive. The thought of not being able to reach them and the idea of nobody being able to come in or out was scary,” commented Ortega. Unfortunately, many similar cases have been reported to the authorities, but more awareness needs to be brought to the issue before additional help is sent. Unlike the easy access to Texas and Florida during Hurricanes Harvey and Irma, Puerto Rico is an island roughly one thousand miles from the coast of Florida, and many Americans are using its location as an excuse to deny Puerto Rico, whose people are United States citizens, help. American aid came many days after the actual hurricane, leaving many inhabitants in despair, especially since most of the supplies were shipped to the bigger cities, taking time to trickle down to smaller towns. For the people of Puerto Rico right now, anything will help. With enough support, their recovery will surely come. In fact, students can directly aid the community devastated by the hurricane at Central. Puerto Rican students Rawyn Mercado (278), and Melanie Torres (277), along with a number of other students, have been collecting monetary donations during advisory. According to Mercado, “We have gotten a lot of support in terms of money donations, but we would now like to emphasize other things such as canned foods, toiletries, OFF, batteries, flashlights, baby products, and clothes.” In addition, students are encouraged to look through their closets in search of any spare articles of clothing that they can donate. Donation boxes are still in the process of being set up around the school, but donations can be brought to rooms 209 or 309. The drive is running through November, so there is no rush to bring in supplies immediately, though quick response is preferred. It is crucial to help out because even the smallest of donations can go a long way.